…supporters asking eBay and Craigslist to require serial numbers on bike listings. Whoa, that’s sounds like a lot. Just how big is 51,203? 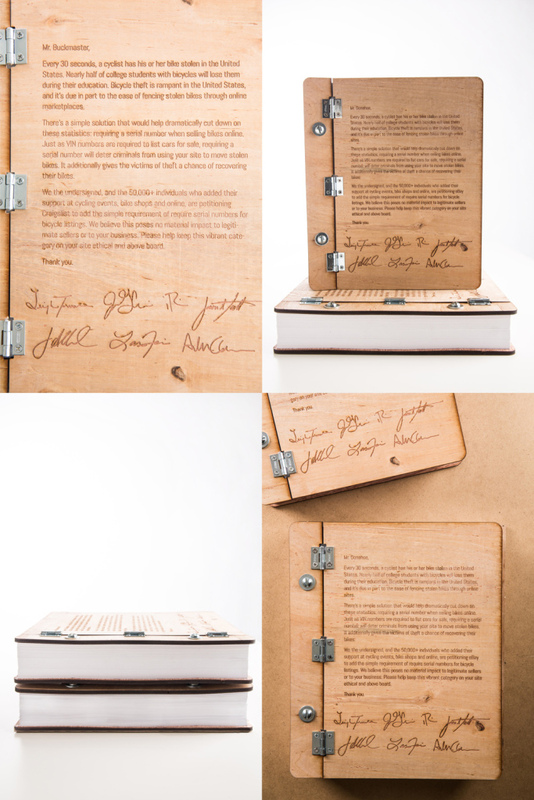 Printed single spaced, the list would be as tall as the Statue of Liberty… standing on top of the Seattle Space Needle! Our supporters outnumber game 7 of the World Series ticket holders by 10,668. In miles, 51,203 would be more than two laps around the planet! When printing your names double sided, single spaced, you weigh in at over 7 pounds! Hey, it’s not like this is the Declaration of Independence, but we’re thrilled by the support that the community has put into this effort. When we started the petition back at The Sea Otter Classic (having never done a petition before) we set the “crazy” goal of getting 20,000 signatures. When it was clear we were going to hit that, we upped the goal to 50,000 having no idea if that was possible. Well, it was and for that we say THANK YOU. 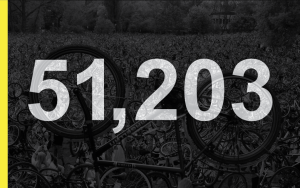 All that said, this effort has never really been about a “number” – the focus has always been around educating and motivating Craigslist and eBay to adopt this sensible requirement to help protect the cycling community. The 529 gang at HQ with the final petition before sending off to eBay and Craigslist. …and of course we live in Portland. 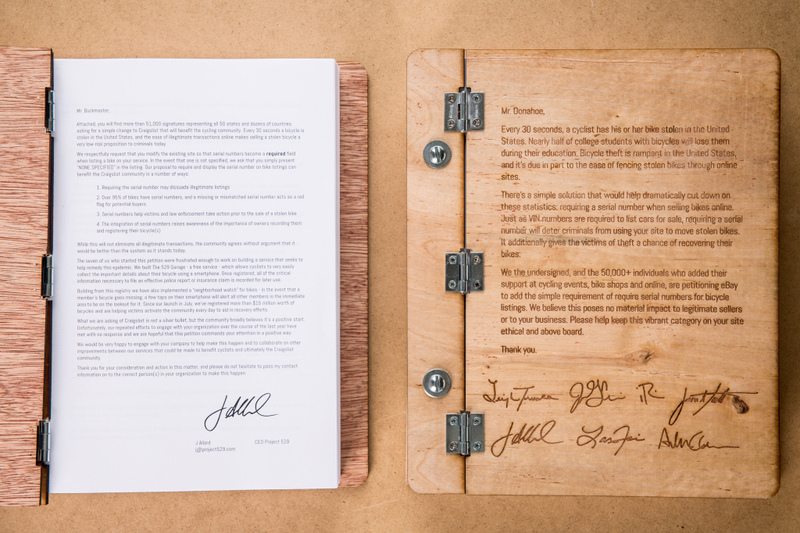 So, we came up with the idea of crafting a wooden binder with the petition text (slightly modified for the two companies) and the signatures of the team at 529 laser etched on the cover. ADX here in Portland were our partners in crime on the amazing laser-etched cover. Thanks guys! We also included a cover letter giving a little more context and a selection of write-in comments from supporters (about 5 pages worth). Side by side, ready for shipping. It was a little extra work, but work that we felt was an appropriate and fun way to celebrate the passion of everyone that supported the effort. 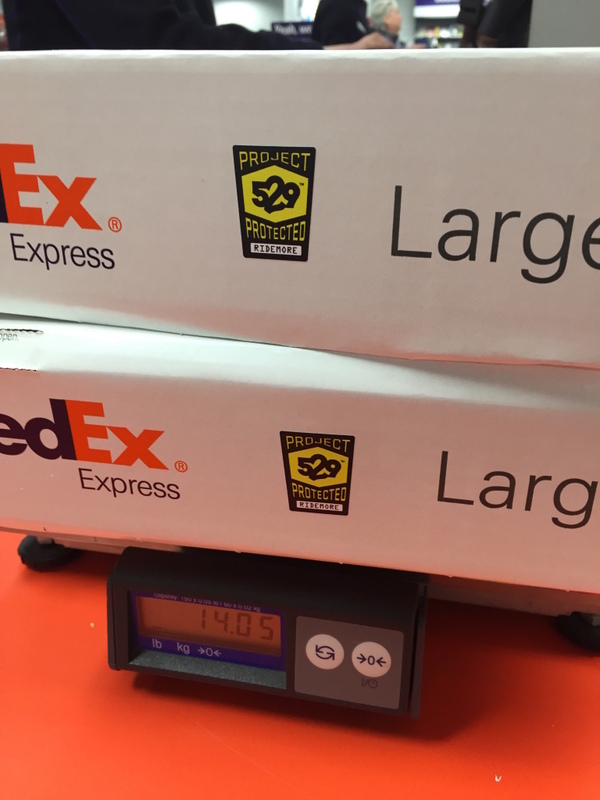 We packed them up and shipped them out last week via FedEx to the two CEOs and dropped a courtesy note to their PR teams explaining that we wouldn’t publicize its completion and delivery until today so that they might be prepared for any questions. 14 pounds of frustration and passion from 50k+ cyclists. Once again, thank you everyone for lending your voice to this important effort (see: How We Got Over 50,000 Signatures on our First Petition Ever). We’re optimistic that the volume of supporters and the way that we have gone about this will be positively received. Of course, we will let you know as soon as we hear word back from the organizations. If you’re not already, be sure to sign up for our newsletter to stay in the loop. In addition to listing the serial number, I recommend that Craigslist and Ebay prominently recommend buyers to verify the serial number on the bike when purchasing, matches the serial number listed in the advertisement. Otherwise thieves could easily post an erroneous serial number when selling stolen bikes. Not every buyer will verify the serial number, but even if some buyers do, this makes the stolen bikes more difficult to sell. For people selling bikes while listing the incorrect serial number, it might also be recommended that buyers report such persons to the police, especially if they notice anything else suspicious. Great work! I’m so proud of you all and pleased to be part of this effort. I also really admire your efforts to be positive and creative. Way to go! Thanks Anastasia – given how negative the problem is that we’re working on, positive energy is vital in turning the tide. Most of us on the team have worked in big companies and appreciate just how many agendas, priorities and customer demands are placed on them everyday, so we were deliberate in asking for modest changes in a constructive way. Fingers crossed! Great work guys! I’ll keep spreading the word. Thanks David! Please do. To put a dent in this epidemic, the community needs to come together. 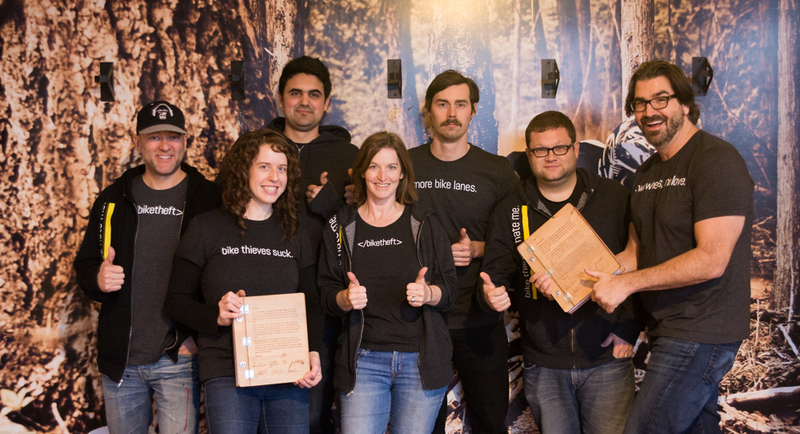 We’re happy to write some software, but its up to the community to take action, register and look out for one another. Thanks for your support.